Countdown to 2015 released its first report in December 2005, when it held its first international conference at the University of London. 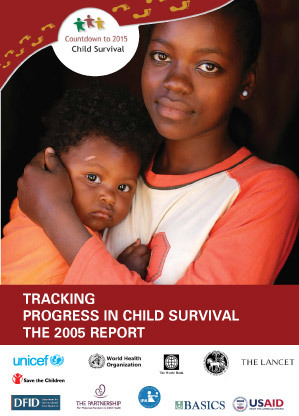 The 2005 Report focused on newborn and child survival in the highest-burden countries, following the recommendations of a groundbreaking series of articles in The Lancet two years earlier. The 2005 Report included country profiles for 60 priority countries representing almost 500 million children under age five — more than 75% of all such children then living — and representing 94% of all child deaths. An article summarizing and expanding on the 2005 Report results was published in The Lancet in September 2006. The data show just how much remains to be done. But they also show that we are on the brink of unprecedented opportunities. In a very short time, some countries have made giant leaps in coverage. Other countries are struggling, and have been ranked as “high alert” on numerous indicators. Countdown results should stimulate hard questions about why there is progress in coverage for some countries, for some interventions, and not in others. None of the 60 countries has achieved even minimal coverage levels for all or most child survival interventions appropriate to their settings. All parties – Governments, partners, researchers, and individuals – must work toward the common goal of achieving high, sustainable and equitable coverage for maternal, newborn and child survival interventions. Inclusion of selected newborn indicators in household surveys will support better tracking of progress in future reports. Improving coverage with neonatal interventions is an urgent priority. Why focus on intervention coverage? Why track coverage at global level in preference to other possible indicators? How is coverage currently measured, and how often? What are the limitations of focusing on coverage?